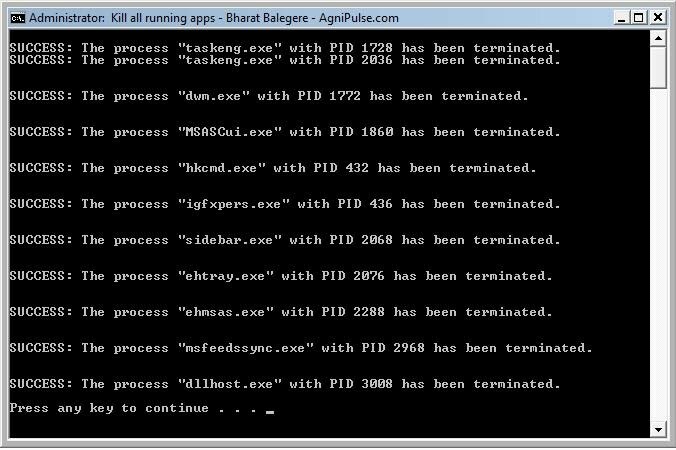 I have created a batch file which determines all the process started by the user and terminates all these processes. It kills only the processes started by the user.These processes includes tray applications and background applications. Using this batch file you can free up lots of RAM before starting any memory intensive application like Games or Video Encoders.You don’t have terminate each and every application to free up RAM. This batch file works with both Windows XP and Windows Vista. To kill all running apps just download kill.bat and double click on it. If you DO NOT want a particular process (example firefox.exe )to be stopped . ERROR: impossible to recognise search filter. this batch file should be placed in the startup folder in the documents and settings. It can’t kill anything if it is no started before the naughty bugs start biting. Let me know if this solves the problem. It works fine on XP SP3. Windows includes tasklist by default. Maybe your xp is a customized one which does not have tasklist. I think tasklist is only in the Pro versions. Tested two home versions no tasklist. Yes, it is not included in XP home. Like Kisk said, if you can get those two .exes off a Pro machine, just drop them in the system32 folder on your main drive and it will run from there. how do i get things back? Just add the process name of your shell in the exceptions list. sandbox ie sandboxed web browser? go with shortcut CTRL-ALT-DELETE to start task manager and add explorer.exe in new task. Hello, i would like to thank this website, i am very, nice working blog. I will probably set a link from my site. Nice Webblog, thanks for all the Info. I will re-visit later looking forward for more fine articles. Nice little script. I’m adapting it. XP Home, as said, lacks “taskkill” and “tasklist” but DOES have “tskill”. Any ways to work this into the script, rather than counting on the ability to drop files into Sys32? I like this utility EXCEPT it won’t work with programs with a spaces in them. It also closes and will not pause at the end so I put pauses throughout but the last pause doesn’t work. This batch file working perfect but as Chris Robertson mention above. it is not closing those exe files which has spaces or “-” signs. Would be much appreciated if anyone will fix this bug. I’ve modified this .bat to support space and the taskkill to kill the processes only the current user. To debug, open the prompt and execute the script into the prompt (example: c:\scripts\kill.bat).